Chameleons is the latest incredible deck series from EPCC. Designed by world-renowned magician Asi Wind and made from Expert’s Classic stock, the deck feels familiar yet superior to standard decks. It’s engineered to be the ultimate deck for magicians to use to improve performance and is the first release for the new Expert Signature Series playing cards. This series will feature decks designed by the real superstars of magic and cardistry! Expert’s Classic stock ensures that these decks won’t vary from deck to deck. The cut is always perfect for faro shuffles (bottom up and tabled). The registration is perfect, so they are beautiful and the borders don’t flutter when riffled. The deck comes in Mnemonica order cut to the Ace of spades (on the bottom). Any Mnemonica user is ready to do miracles just by opening a brand new deck in front of a spectator, removing the jokers, and cutting once. And the most exciting thing is that these decks all come in tuck cases made of Expert’s new exclusive synthetic paper. These amazing tucks are waterproof and will last and last. The worn out tuck box problem plaguing working magicians is now a thing of the past. The Chameleons come in three versions. Ultra Luxury Metallic Green with Foil on the cards, $19.95. 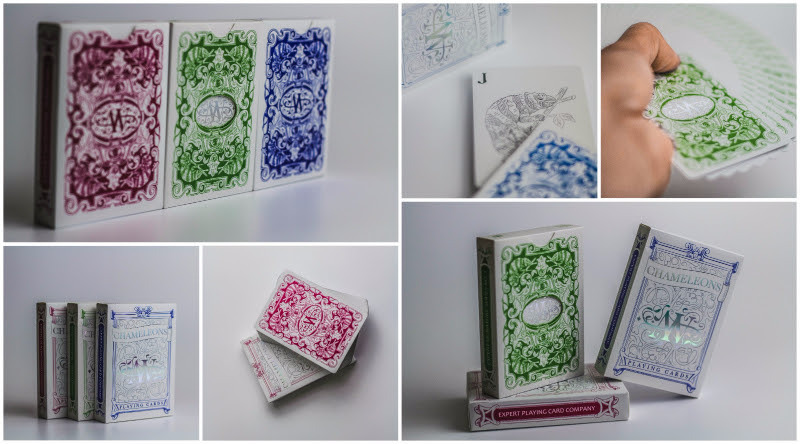 This version comes in a specially designed tuck with a die cut hole so that the beautiful iridescent foil stamped on each card back can be seen even while the deck is safely boxed.